This is the navy wool version with the plastic adjustable strap in the back that has the VF-1 squadron LOGO (red/white) embroidered directly onto the front of the cap. A very nice cap!! This is the navy wool version with the plastic adjustable strap in the back that has the VF-1 squadron name and frontal view of the F-14 Tomcat embroidered directly onto the front of the cap. This is the khaki ballcap with the adjustable leather strap in the back that has the VF-1 squadron designator, "callsign" and frontal view of the F-14 Tomcat embroidered directly onto the front of the cap. This is the navy wool version with the cloth/velcro adjustable strap in the back that has the VF-2 squadron LOGO (red/white/blue) embroidered directly onto the front of the cap!! This is the stone-washed blue version with the leather adjustable strap in the back that has the VF-2 squadron LOGO (red/white/blue) embroidered directly onto the front of the cap!! This is the khaki version with the leather adjustable strap in the back that has the VF-2 squadron LOGO (red/white/blue) embroidered directly onto the front of the cap!! This is the navy wool version with the plastic adjustable strap in the back that has the VF-2 squadron name and frontal view of the F-14 Tomcat embroidered directly onto the front of the cap. This is the khaki ballcap with the adjustable leather strap in the back that has the VF-2 squadron designator, "callsign" and frontal view of the F-14 Tomcat embroidered directly onto the front of the cap. This is the 'BULLET' version of the khaki ballcap with the adjustable leather strap in the back and the logo embroidered directly onto the front of the cap. This is the "Gordon Above Shield" Navy blue version of the Red Rippers ballcap. It has an adjustable strap in the back and squadron history is listed below. This is the form-fitting 'stone-washed blue' ballcap with the squadron mascot (better known as "Ripper") embroidered directly onto the front of the cap for the VF-11 crews stationed at NAS Oceana, VA that flew the F-14 Tomcat. This is the form-fitting khaki ballcap with the squadron mascot (better known as "Ripper") embroidered directly onto the front of the cap for the VF-11 crews stationed at NAS Oceana, VA that flew the F-14 Tomcat. This is the "official" Navy blue ballcap with the squadron mascot (better known as "Gordon") embroidered directly onto the front of the cap for the VF-11 crews stationed at NAS Oceana, VA that flew the F-14 Tomcat. The Red Ripper squadron insignia as described by an early member: "The boar's head is taken from the one that graces the label of the Gordon's Gin bottle. The scroll effect under the head is a string of link sausage, a good line of bologna which all members of the squadron were to be adept at 'shooting.' The balls on the shield might be called balls of fire; actually, they were supposed to typify good, strong masculinity. The bolt of lightning was the bar sinister of bastardy. The whole theme was worked into a sort of toast or creed with which the squadron members were to begin and end all good drinking bouts. The official Ripper toast is, 'Here's to us, the RED RIPPERS � a damn bunch of gin drinking, bologna slinging, two-balled, he-man bastards'." In 2011, while on liberty in Bahrain, high ranking authorities declared the toast inappropriate and offensive; the toast was banned shortly thereafter. This is the other "official" Navy blue ballcap with the squadron mascot (better known as "Gordon") embroidered directly onto the front of the cap for the VF-11 crews stationed at NAS Oceana, VA that flew the F-14 Tomcat. The Red Ripper squadron insignia as described by an early member: "The boar's head is taken from the one that graces the label of the Gordon's Gin bottle. The scroll effect under the head is a string of link sausage, a good line of bologna which all members of the squadron were to be adept at 'shooting.' The balls on the shield might be called balls of fire; actually, they were supposed to typify good, strong masculinity. The bolt of lightning was the bar sinister of bastardy. The whole theme was worked into a sort of toast or creed with which the squadron members were to begin and end all good drinking bouts. The official Ripper toast is, 'Here's to us, the RED RIPPERS � a damn bunch of gin drinking, bologna slinging, two-balled, he-man bastards'." In 2011, while on liberty in Bahrain, high ranking authorities declared the toast inappropriate and offensive; the toast was banned shortly thereafter. This is the dark blue ballcap with the adjustable plastic strap in the back that has the VF-11 squadron designator, "callsign" and frontal view of the F-14 Tomcat embroidered directly onto the front of the cap. This is the khaki ballcap with the adjustable leather strap in the back that has the VF-11 squadron designator, "callsign" and frontal view of the F-14 Tomcat embroidered directly onto the front of the cap. This is the navy wool version with the plastic adjustable strap in the back that has the VF-14 squadron name and frontal view of the F-14 Tomcat embroidered directly onto the front of the cap. This is the khaki ballcap with the adjustable leather strap in the back that has the VF-14 squadron designator, "callsign" and frontal view of the F-14 Tomcat embroidered directly onto the front of the cap. 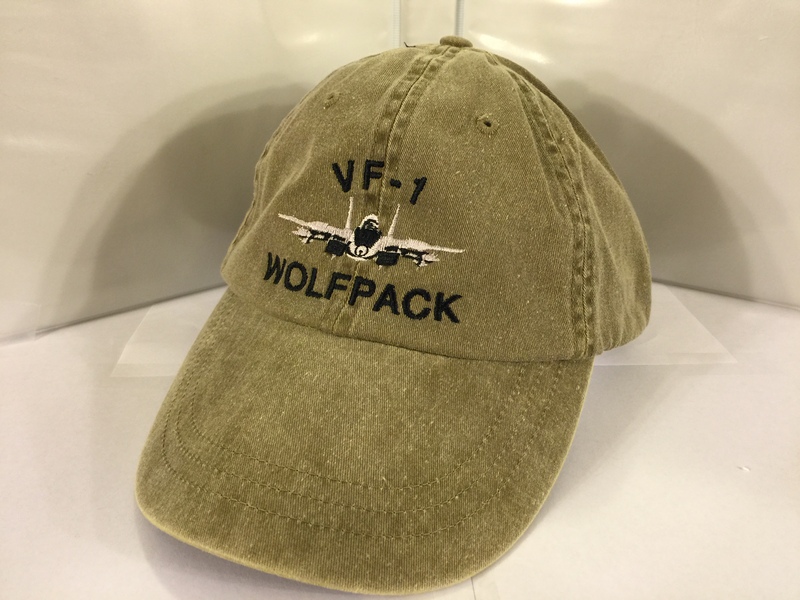 This is the navy wool version with the plastic adjustable strap in the back that has the VF-21 squadron name and frontal view of the F-14 Tomcat embroidered directly onto the front of the cap. 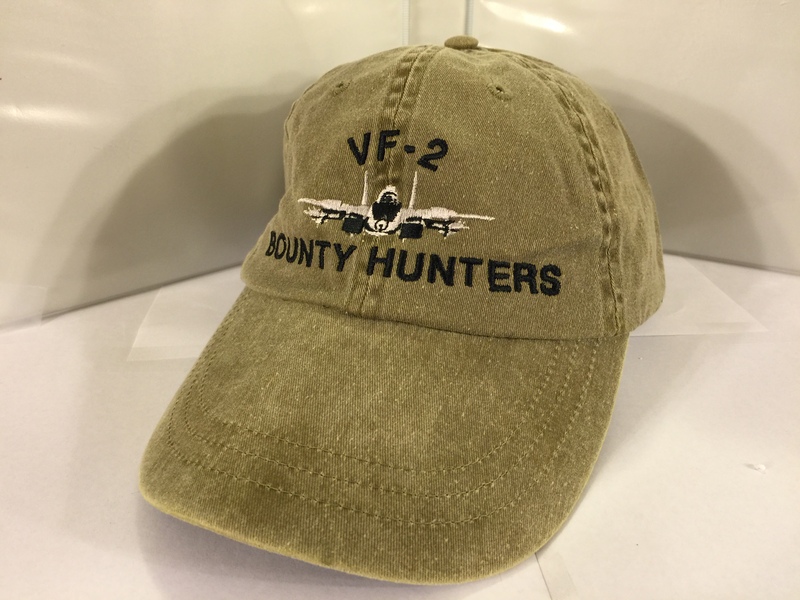 This is the khaki ballcap with the adjustable leather strap in the back that has the VF-21 squadron designator, "callsign" and frontal view of the F-14 Tomcat embroidered directly onto the front of the cap. 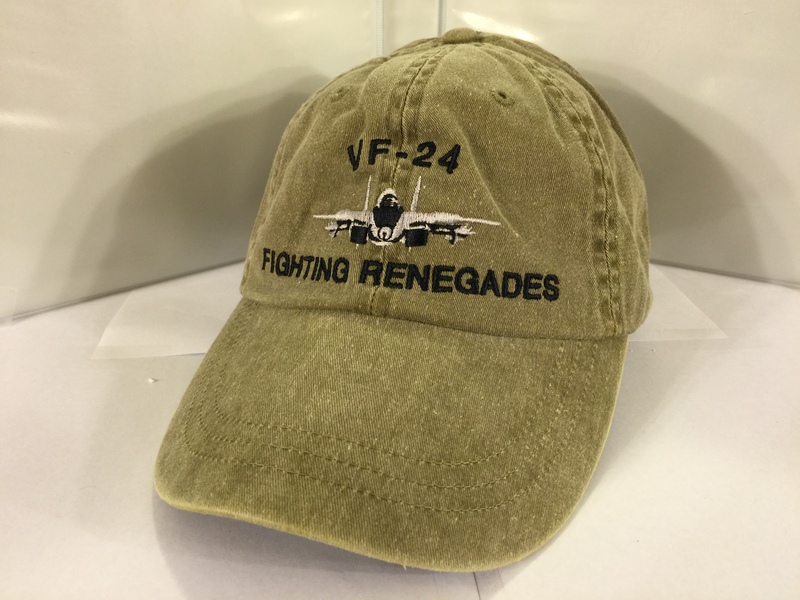 This is the navy wool version with the plastic adjustable strap in the back that has the VF-24 squadron name and frontal view of the F-14 Tomcat embroidered directly onto the front of the cap. This is the navy wool version with the plastic adjustable strap in the back that has the VF-31 squadron name and frontal view of the F-14 Tomcat embroidered directly onto the front of the cap. This is the khaki ballcap with the adjustable leather strap in the back that has the VF-31 squadron designator, "callsign" and frontal view of the F-14 Tomcat embroidered directly onto the front of the cap. This is the "unofficial" form-fitting khaki ballcap with the squadron logo embroidered directly onto the front of the cap for the VF-31 crews stationed at NAS Oceana, VA that flew the F-14 Tomcat. This is the dark blue ballcap with the squadron logo embroidered directly onto the front of the cap for the VF-32 crews stationed at NAS Oceana, VA that flew the F-14 Tomcat. This is the "unofficial" form-fitting khaki ballcap with the squadron logo embroidered directly onto the front of the cap for the VF-32 crews stationed at NAS Oceana, VA that fly the F014 Tomcat. This is the khaki ballcap with the adjustable leather strap in the back that has the VF-32 squadron designator, "callsign" and frontal view of the F-14 Tomcat embroidered directly onto the front of the cap. This is the "unofficial" form-fitting khaki ballcap with the F-14 Tomcat's frontal view embroidered directly onto the front of the cap for the VF-32 crews stationed at NAS Oceana, VA that flew the F-14 Tomcat. 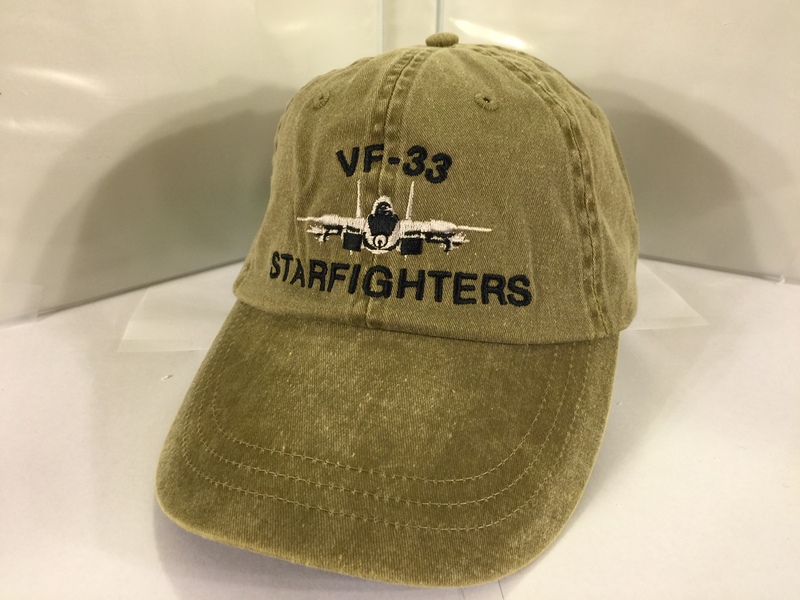 This is the navy wool version with the plastic adjustable strap in the back that has the VF-33 squadron name and frontal view of the F-14 Tomcat embroidered directly onto the front of the cap. This is the black "form-fitting" version of the "Black Aces" ballcap with the F-14 Tomcat embroidered directly onto the front of the cap. This is the black version of the "Black Aces" ballcap with the F-14 Tomcat embroidered directly onto the front of the cap. This is the navy wool (dark blue) version with the plastic adjustable strap in the back that has the VF-33 squadron name and frontal view of the F-14 Tomcat embroidered directly onto the front of the cap. This is the navy wool (dark blue) version with the plastic adjustable strap in the back that has the VF-33 squadron name and frontal view of the F-14 Tomcat embroidered onto an patch, then heat-sealed onto the front of the cap. This is the khaki ballcap with the adjustable leather strap in the back that has the VF-41 squadron designator, "callsign" and frontal view of the F-14 Tomcat embroidered directly onto the front of the cap. 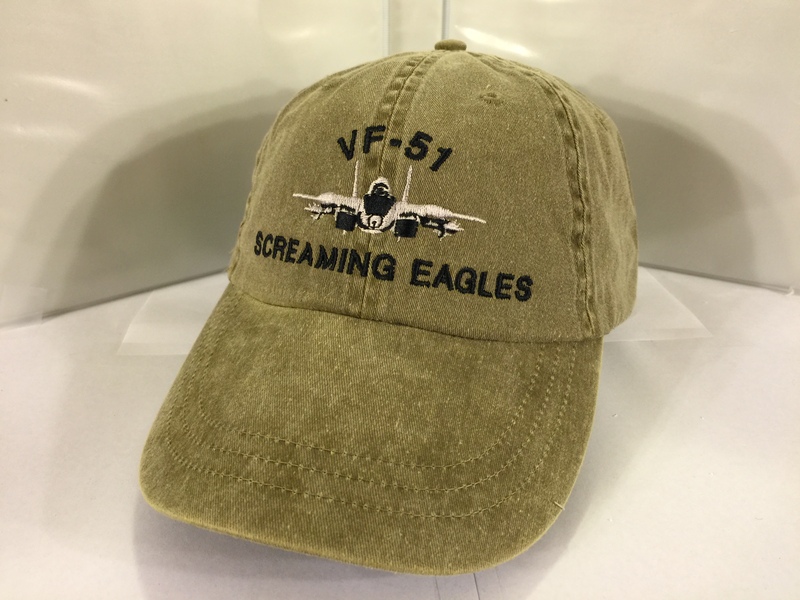 This is the navy wool version with the plastic adjustable strap in the back that has the VF-51 squadron name and frontal view of the F-14 Tomcat embroidered directly onto the front of the cap. Homepage | Order VF Ballcaps!